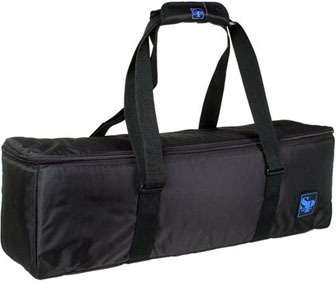 · This kit bag can transport SP Systems or similar strobe outfits and accessories. It holds compact light stands and umbrellas, keeping them separate from fragile lights stored below. It features moveable padded dividers and a shoulder strap. Ballistic nylon shell, foam padded interior, with hook and loop fasteners and zippered closure. · Interior: 34 x 9 x 8 in (86 x 29 x 20 cm).